Cookies and Comics? Sounds Rad! I like to talk about comics on this blog quite often. I also sometimes will discuss food. Therefore, it makes sense that my post today is about a product that involves both! You see, I first read about Einhorn's Epic Cookies via a post on Bleeding Cool that went up a bit ago. It sounded fascinating so I checked out the website and found myself even more curious. Therefore, I got in touch with the folk behind Einhorn's Epic Cookies and got my hands on some of the comics--and of course the cookies too. "What are Einhorn's Epic Cookies?" you may be asking, especially if you didn't click the link. Well, they are large single-serving cookies put into their wrapper with a mini-sized comic-book about some cool humanoid unicorns. There are four different flavors (which I'll discuss shortly) and you never know which issue of the comic (there are currently six print issues) you'll get with your cookie--although you can read the comics online too in order to follow the whole story. Created by Heather Einhorn--whose last name in fact is German for, "Unicorn," hence the name for the characters--Einhorn's Epic Cookies combine the fun of comics with the yum-factor of cookies, and are especially cool thanks to the creative flavors the cookies have (again, be patient and I'll talk about them soon). Heather is a veteran of comics, having helped DC with comic conventions via the marketing department before going to work for Legendary Studios and helping them in the launching of Legendary Comics (i.e. the comic-division of the studio); Heather also is clearly imbued with quite the sweet tooth, which inspired her to go about creating the cookies. Creative Director Adam Staffaroni also was heavily involved in the creation of the comics, helping them get their fun tone and feel. I asked them via email if they came up with the cookies or the concept of a unicorn-squad first, and they responded how it all basically evolved together into the exciting mix of tastebud-pleasing and visual fun. How are the comics and cookies though? Farragut is kind of a jerk. The comic-books follow the Royal Einhorn Force (R.E.F. ), a group of Unicorns tasked with protecting the king of Eintropolis as a sort of royal bodyguard group. The King has a golden horn that marks him as the ruler, and it is known as the Einhorn. The first issue is "jumbo-sized" as it says, and follows the four royal guards before they split off for separate adventures the second through fifth issues of the comics cover, with them reuniting at the end of the fifth. Their names are Houston, Broxburn, Romsey, and Cadiz, and each currently has a cookie-flavor which carries their name. The events of the first issue involve the king being betrayed by another royal staff member named Farragut and kidnapped by Farragut's own mini-army. At this point the R.E.F. breaks apart as I mentioned and proceeds to each tackle an obstacle posed to them by Farragut's treachery. Houston attempts to rescue the King, Romsey disrupts a broadcast of lies claiming the R.E.F. killed the king, Broxburn fights one of Farragut's toughest lackeys, and Cadiz gets the spaceship ready for when all the crew arrive at the designated meeting location. This all leads into the sixth issue where we get a little background on the Einhorn and see our heroes working at hatching a plan to save the King from Farragut. The self-aware humor is fun. Each issue is good fun and relatively self-contained in that you can understand what is going on without the other issues--although thanks to the issues being released online too it isn't really a problem anyway. The comics are all-ages but not in a childish sense--just accessible in that anyone can pick them-up and enjoy them. Also, there is some self-aware humor that illustrates how the comic is aware of its more absurd elements and wants to give the reader a sly-wink--but things never delve into utter parody. For example, when Romsey distracts some evil soldiers by having his break-dancing friends get their attention it is pointed out how bizarre and random it all is. Between the colorful and fun artwork combined with the humorous and action-packed writing, it is all very reminiscent of a Saturday-Morning Cartoon--something which Heather and Adam told me were big inspirations. Just like a Saturday-Morning Cartoon, the Royal Einhorn Force comics are delightful and I was pleased that I liked them as much as I did--after all, if just the cookies were good and the comics were not that would be a shame (it'd be even worse if both were bad). Speaking of the cookies though, how about I finally tell you about them as I had promised earlier? I was excited to tear into these! Each cookie flavor is unique in its taste and creativity, with chocolate chips featuring in three of the four cookies but only being the focus in one. They are a bit more expensive than the kind of cookies in a single-serving packet you would get at the grocery store, but as they are more-so your specialty-kind of cookie and shipping is included in a purchase I would say it's still a reasonable price. Romsey is perhaps the best-known cookie, being a peanut butter one with some chocolate chips and bacon. Yes, you read that right, there is a bacon-flavor to the Romsey cookie! Now, if you're a vegetarian you actually can still eat a one of these as it contains faux-bacon, or fakon. It actually still tastes very good and adds a nice salt to the cookie though so don't worry about its being non-meat impacting the flavor. I shared Romsey with a friend who loves peanut butter cookies and they were very impressed, but I have to be honest and say I'm not a huge fan of peanut butter cookies, although the addition of bacon gave it a nice "zing". Should you be someone who adores this type you will arguably be in heaven, but for me it was just a nice regular cookie made a bit above-average by the fakon. I liked this one a good deal. Soft and containing just the right amount of sweetness, the oatmeal cookie has a tasty addition of maple to give it a sensation of almost melting in your mouth. There are chocolate chips too but I think they almost detract from the pleasure of tasting the oatmeal and maple working in conjunction to give you a wonderful flavor sensation. That said, Broxburn is really good and one of the tastier Oatmeal cookies I have had, rivaled only by the oatmeal cookies of my fianceé. The Houston cookie is your basic chocolate-chip type, but with an additional flavor that gives it an awesome extra crunch. This would be a stellar chocolate-chip cookie on its own, but the addition of little shards of potato chips take it to a whole different level of superb taste. As a big fan of chocolate-chip cookies I was pleased to find the potato chips added to the flavor instead of subtracting any enjoyment, giving the sweet chocolate a nice savory touch. I would declare this my favorite cookie were it not for how much I adore the next one. This is it, something just incredibly delicious. I shared some of this with a friend who thought it was too sweet for them, but that person was crazy because when something is a sugar cookie containing a birthday cake flavoring, sprinkles, and crisped rice it has gotta be sweet! Cadiz is like everything I adore about sugar cookies plus the addition of some crispiness thanks to the krispies. Biting into a Cadiz cookie is like having a party in your mouth, and all the flavors are invited--"Birthday cake? You're in! Sprinkles? Alright! Rice crisps? Aw, you know you're welcome here!" Cadiz has a great crunch to it, with that bit of "give" thanks to the rice crisps, and really is like taking a stroll back into your childhood when you dreamed up crazy flavors for food, except in this case someone actually went and made your insane idea an insanely-good flavor of cookie. The flavors found in Einhorn's Epic Cookies are all solid, and depending on your flavor preference you may disagree with me (I'm sure someone out there is screaming in rage at my score for the peanut butter cookie because that's his/her favorite) or think I'm right on-the-money. I would encourage you to try all the flavors if able, with the store found here, but if you can only do one, I'm a Cadiz fan all the way. Einhorn's Epic Cookies are--if you'll pardon the cliché of the saying--two great things that are even better together, with the "things" in this case being tasty cookies and radical comics. After tasting and reading everything I can consider myself a big fan and someone who proudly supports the Royal Einhorn Force in their mission of protecting Eintropolis and giving us delicious sweets. 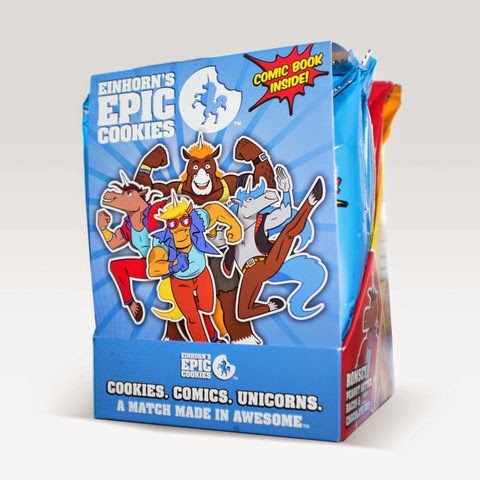 I would encourage you to check out Einhorn's Epic Cookies' website (here's a link again) to explore the comics, learn more about the flavors, and perhaps enjoy the fun 80's-style theme song. I know once I save up some scratch I'm going to get me a t-shirt to show my support! Now the only questions are if the R.E.F. will be able to save the king, and what your favorite flavor will be.